Jeffrey Herlings produced an ironman performance at the MXGP of Indonesia to take the overall win despite racing with a broken collarbone. The Dutchman admitted at the start of the weekend that his participation, less then three weeks after a major practice crash, was a damage limitation exercise but the Red Bull KTM rider – second in the opening moto ¬– sewed up the overall following a dramatic final few laps in race two. Herlings had a four-second lead over team-mate and title rival Tony Cairoli when, in the closing stages, he fell and allowed the Italian through. 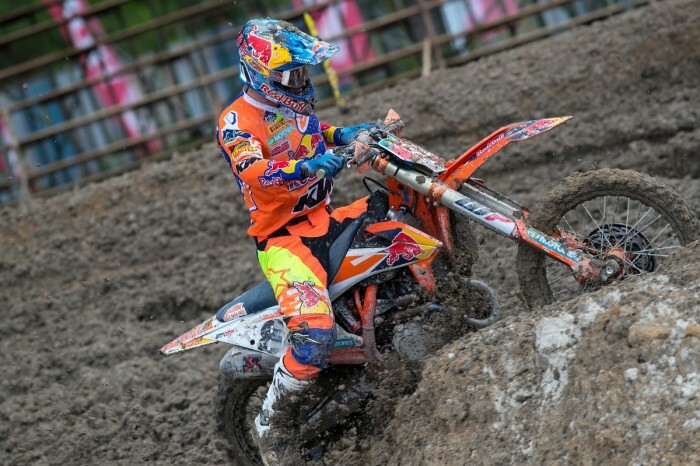 However, Cairoli then crashed to hand the advantage back to the championship leader. The end result was that they were both tied on points with Herlings getting the verdict on a tie-break. “I pulled really good starts this weekend, especially today with two Fox holeshots so I’m really happy about it,” said Herlings. “In race one I just tried to be smart – I felt like I could run Tony’s pace but not for 35 minutes. After the chance to halve Herlings’ lead to six points slipped through his fingers, defending champion Cairoli was understandably downbeat.